My guest this week is Randy Mosher, who just published his new book Mastering Homebrew (Amazon affiliate link). Mastering Homebrew is an comprehensive book on beer brewing that focuses on not only the technical aspects of brewing but also the creative and flavor aspects of brewing great beer. I’m a big fan of this book, and believe it is one of the most important brewing books to come out in the last few years. Randy is also the author of Radical Brewing and Tasting Beer. 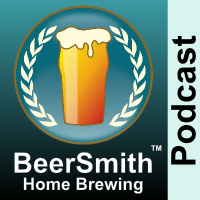 Also check out BeerSmith Mobile software and , the new DVDs John Palmer and I filmed – How to Brew with Malt Extract and How to Brew All Grain are available now. Randy starts with an overview of his new book – which is really comprehensive in scope and useful for everyone from beginner to expert. We discuss the concept of “using both sides of your brain to brew beer”. Randy explains why both measurables and intangibles are important to making beer, as well as his “flavor” approach to building beer recipes. We talk about ingredients – with a heavy focus on understanding the flavor of various malts and other ingredients. Randy also covers many technical aspects of brewing in the book – we discuss a few. We talk about brewing equipment and Randy shares a few examples. Randy shares some of the tools of the brewers art. We finish with a discussion about what’s different about this book.